Make your mail stand out with this vibrant pink return address label selection from CheckAdvantage. Every envelope you stick in the mailbox will have a style that is uniquely you! Two rosy shades are separated by an elegant white stroke that creates a curvaceous design. While you'll love how your letters and packages look, you'll also be quite impressed with how convenient this product can be. Say goodbye to hand cramps from writing your return address over and over again. Since these are self-adhesive labels, it's as simple as peeling and placing them on all your outgoing mail. 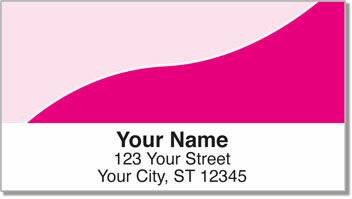 Get your very own Pink Graceful Line Address Labels today! If you're not into pink, you can also find three other options or get all four in a multi-color set.